Moist and chewy Orange Oatmeal Bars make a simple holiday dessert. 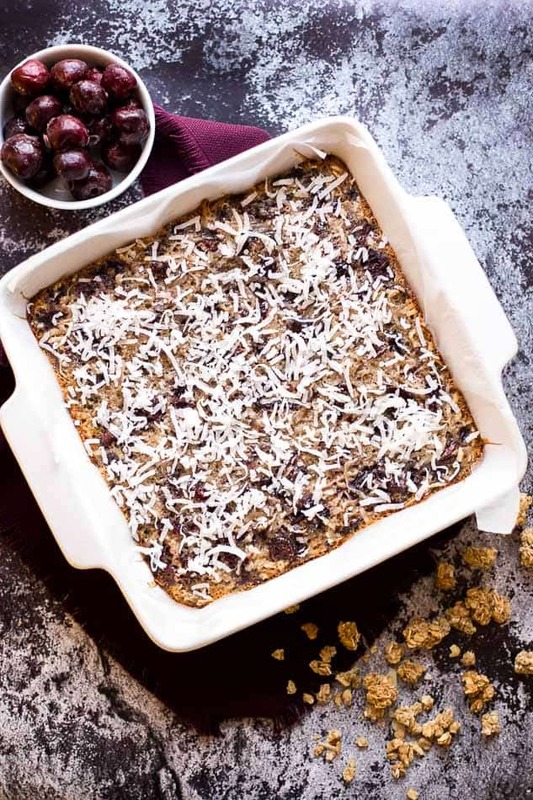 Dense oatmeal and crunchy granola base with gooey coconut cherry orange topping. If you’re a fan of breakfast and granola, I got a treat for you…quite literally. 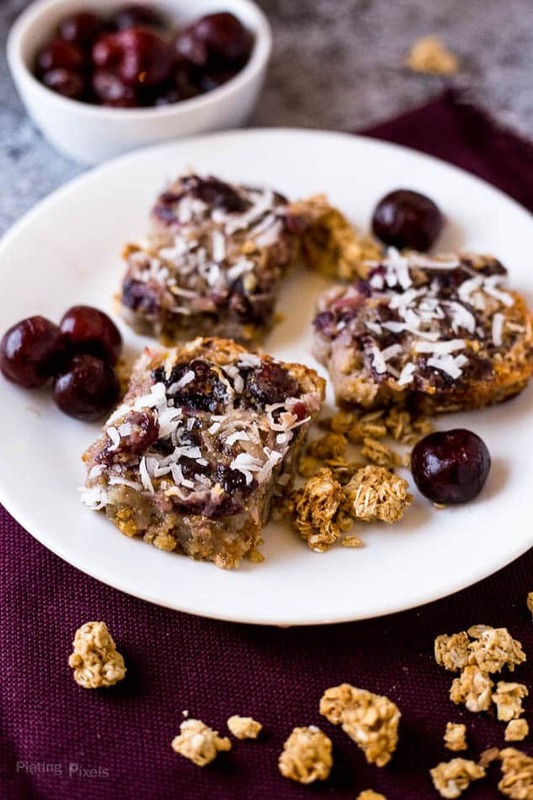 These Chewy Cherry Orange Oatmeal Bars take the wholesome goodness of breakfast and combines it into a fun holiday dessert. Since breakfast and desserts are two of my favorite food categories, it was only fitting. Almost every holiday I spend with my parents includes homemade desserts. The times we create a meal together are often the most memorable. These cherry orange oatmeal bars could be enjoyed as a sweet brunch treat or an after dinner dessert. Once you have the granola oatmeal base ready you can prep the cherry orange topping. 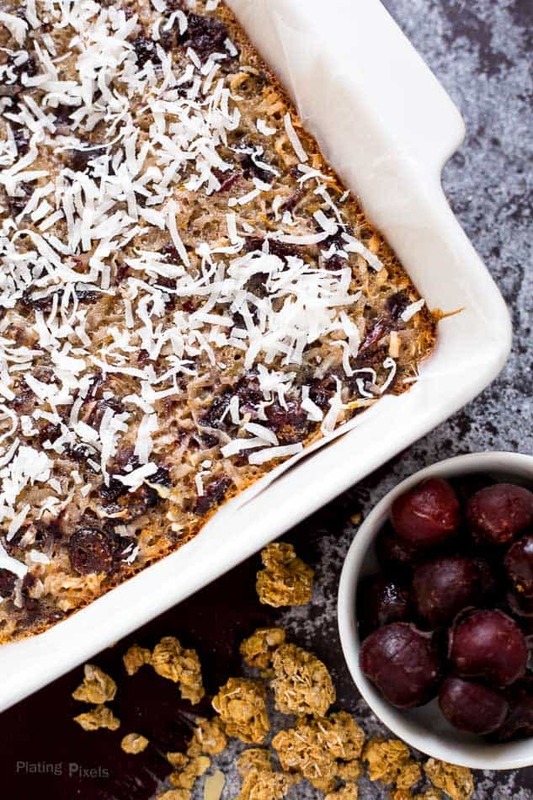 Ingredients like eggs, shredded coconut, fresh orange zest, cranberries and cherries creates a moist and creamy topping that pairs with the dense, chewy crust. Bake until combined into one delicious dessert with two layers. Flavor profiles: Strong orange and cherry flavors with a sweet and salty oatmeal crust. Texture: Dense and chewy oatmeal cookie base with gooey cherry orange topping. 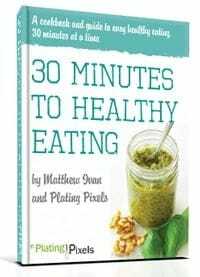 Preheat oven to 350 F. In a large bowl combine flour, sugar and baking soda. Cut in butter with a pastry knife or fingers until crumbled and well incorporated. Stir in granola and oats. Press mixture into a 9x9 baking dish and bake 7-9 minutes, until slightly set. Remove from oven and cool slightly. In a large bowl stir together egg, egg white, milk, orange zest and vanilla. Fold in cherries, cranberries and coconut. Spread over crust and bake 30-35 more, until center barely jiggles and edges are golden. Cool on a wire rack at least an hour before cutting into bars. Sprinkle with additional coconut as garnish. Delicious and healthy snack, Matt! I love the combination of ingredients and the flavors are mouth-watering. Finally a healthy dessert! I love cherry and orange combination. These oatmeal bars look so good! The topping is absolutely the best here: oranges, cherries, cranberries… Yum! Thanks Jovita! Glad you like the winter flavors. First of all, these photos are gorgeous! And the bars sound delicious! I love the orange and cranberry combination! Yummy! Thanks so much Kristine! Yummy indeed.